Les Tu-16P Bouket se reconnaissaient aisément grâce au carénage allongé situé sous la soute à bombes qui contenait l'essentiel de l'électronique embarquée. © Svenska Flygvapnet. The Tu-16P Buket was betrayed essentially by the canoe fairing under the bomb bay, which contained most of the electronic equipment. © Svenska Flygvapnet. 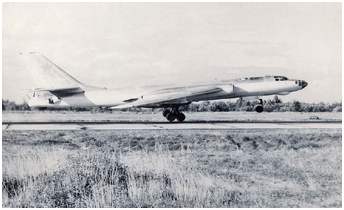 On 6th July 1972, the 132nd Heavy Bomber Aviation Regiment (TBAP) took off at 0215 am from Tartu in Estonia in order to bomb the Wittstock firing range at night with its Tu-16 before returning back to a reserve dirt strip in Byelorussia. They flew above the Baltic Sea all the way up to the East German shores. The 3.AE of the regiment, responsible for electronic warfare, was to pave the road ahead of the bombers with its nine aircraft of the Tu-16P Buket 'Badger-J' and Tu-16 Yelka (pronounced 'Yolka' - Fir) 'Badger-H' types. In addition, the bombers of the other squadrons were equipped with the SPS-5 Fasol (String bean) system designed to disrupt the guiding channels of the fighters. Moreover, some bombers and the Yelka could be equipped with the SPS-100 Rezeda (Mignonette) ECM suite in lieu of the tail turret. 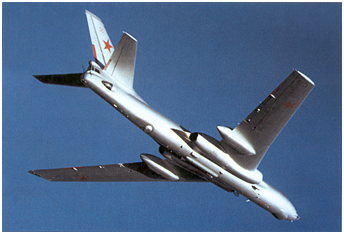 Tu-16P were in charge of active counter-measures with the Buket system that was incredibly effective. Several aircraft embarked different versions (four available) of the jammmer to cover all radar bands. One single aircraft flying between 10 to 11,000 meters was sufficient to protect a group of bombers in a radius of 3 to 5 km. The device was designed to jam long-range detection radars, guiding radars and SAM sites. A container manned by an officer was hung in the rear bomb bay of the Yelka, which undertook the passive counter-measures. These aircraft provided group cover dispensing aluminium strips of various lengths. The operator had an emitting radar parameter receiver that displayed the frequency of threat radars and he employed chaff of a specific length from the appropriate dispenser. There also was a set that cut the chaff to the requisite length prior to it being dispensed. That technology dating back to the 40's remained effective against Nike Hercules missiles developed to counter the bombers. The timely chaff dispensing could indeed cause the early tripping of the missile's radio fuse. As a rule, these were foil strips sometimes 1.5 meters in length, while fiberglass spikes were employed against fighter radars operating at that time in the three-centimeter frequency band. But, these spikes were employed rather rarely and, in the majority of cases, over water since a massive loss of cattle was observed in areas where these were employed. The spikes, entering the cows' stomach, simply penetrated the stomach wall and the animals died. Carte simplifiée montrant l'itinéraire suivi par le 132.TBAP lors du raid sur Wittstock le 6 juillet 1972 ainsi que le vol retour via l'aérodrome de réserve à Jeloudok (d'après http://scucin-avia.narod.ru). 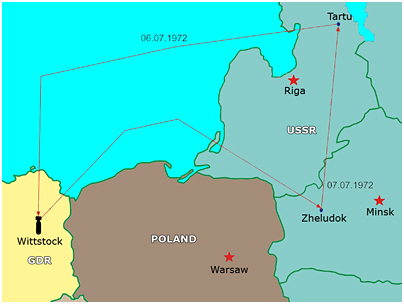 Simplified map showing the route followed by the 132.TBAP to reach Wittstock on 6th July 1972 and its return flight via the reserve airfield at Zheludok (from http://scucin-avia.narod.ru). Flying in tight combat formation the attackers kept those on the air so confused that they completely disrupted control of interceptors such that one pilot had to eject, because he ran out of fuel. They attempted to send a command to cease the jamming, but nothing could be heard except for a cacophony in the headsets. And, it was only through long-range communications that the order came to cease jamming prior to reaching the defined line and only until after confirmation by means of a password. A message came the next day reporting that, at that same time, control over the civilian aircraft in the FRG was paralyzed. The second squadron was flying nine Tu-16K-11-16 'Badger-G', a vector optimized for the carriage of two air-to-ground missiles KSR-2 (AS-5 'Kelt') or the anti-radar version of the same missile, designated KSR-11 (AS-5 'Kelt' too). These aircraft were however carrying 250kg parachute bombs only during the raid on Wittstock. Each crew had been assigned a specific target on the dummy airfield of the firing range (Photo 1 - Photo 2). The nine 'Badger-G' of the first squadron were tasked to drop cluster bombs and mine the 'enemy' airfield to prevent repairs. Meanwhile, these mines detonated at different times so as to destroy the mine-clearers. For that reason, no one approached the range for days. Initially, the bombers flew at medium altitudes, but they descended to 200 meters prior to reaching the East German border at night. Prior to reaching the target itself, three Yelka aircraft popped up and dropped flares. Everything appeared as if it was daytime. The crew of General Kharin, the division commander, was tasked to drop 36 concrete-piercing bombs on the runway. They were late detonating so that the explosions occurred after the group had passed through, but something didn't mesh. Either the other aircraft were late or these bombs were dropped earlier, but they began to burst to the left of Viktor Kabanov's Tu-16. Fortunately, his aircraft got out unscathed. A similar event happened in 1974 at Vozdvizhenka that followed approximately the same scenario; on one aircraft, there was not a single area that was not struck. All the same, they made it to their home airfield. After this mission over Germany, the regiment received the congratulations of the Minister of Defense, Marshal A. Grechko - former commander of GSVG from May 1953 to November 1957 - on an excellent évalutaion. It turned out that he was indeed present in the GDR and that he had attended the night attack.